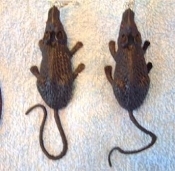 Huge Funky Black RAT EARRINGS - Big Gothic Halloween Horror Mouse Rodent Animal Witch Charm Novelty Costume Jewelry - Large Realistic Toy Mice Rats. Giant Rubbery Plastic Critter Charms, each approx. 2.25-inch (5.63cm) long, without tail. Where are you BEN?